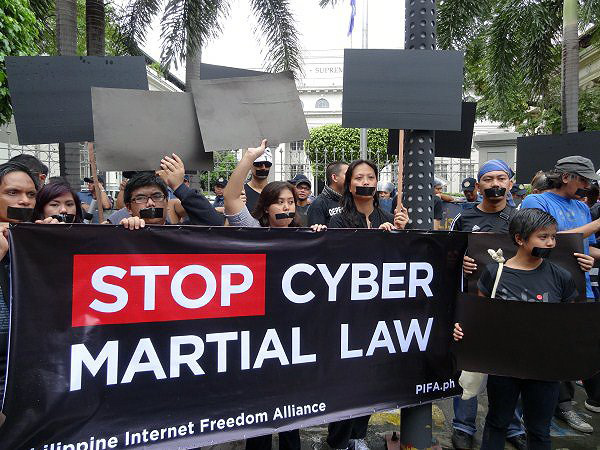 The Filipino people scored a significant victory today as the High Tribunal unanimously stopped the implementation of the controversial Cybercrime Law that infringes on freedom of speech, expression and privacy. The Cybercrime Law was signed by 13 senators and ultimately approved by President Aquino. It was opposed by no more than one senator, Teofisto Guingona III, who also filed a petition to amend the "questionably dangerous provisions" of the law. The temporary restraining order issued by the Supreme Court will last for 120 days. Oral arguments are set on January 15, 2013. I like Guingona, he is very practical and knowledgeable. I'm very, very disappointed with the president. In this case he is very backward and regressive. I've supported him from the beginning but he is very wrong with this law. As for our lawmakers, most are lazy and inept, and some are vengeful. I’m thankful that the people are fighting back. Hopefully the SC will do the right thing and preserve our rights, and defend our constitution.